A trio of new books tell the story — in very different ways — of three of London's favourite markets. 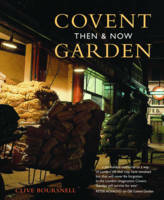 Covent Garden Then & Now by Clive Boursnell must have been a curatorial nightmare for the editor. It seems Bournell has taken so many expressive photos of the market over the past 45 years that condensing them down into 170 pages offered a singular challenge — one that hasn't always been met here. His historic and modern photographs, often of the same location separated by decades, work best when presented one or two to a page. When the publishers cram up to 12 shots onto a single side, it's impossible to appreciate the talent. Still, this is a magnificent collection, covering the grime and graft of the working fruit & veg market of the '60s, and its careworn customers, through to the colourful entertainment hub the space has become today. Those wishing to see Boursnell's work blown up to a more impressive size can check out an exhibition running throughout the market from 29 May. Published 2 May 2013 by Frances Lincoln. Camden Lock and the Market by Caitlin Davies is also around 170 pages, but fills them in a very different way. We learn of Camden's incredible journey from a tiny pop-up market in the early '70s to one of the UK's top tourist attractions today. It's a book full of both character and characters, as Davies interviews important people from the market's history, including the original founders, stall holders and various celebrities who've made the area what it is. There are regular photographic delights, many previously unpublished, including an elephant crossing Chalk Farm Road, the painting of the famous Camden Market bridge sign and the high fashions of the 1980s. If you know the market well, and witnessed much of its short but eventful history, you will savour every sentence, and simply must buy this book. Newcomers looking for a straightforward introduction might find it a little more wordy than it needs to be, but still well worth the cover price. Published 6 June 2013 by Frances Lincoln. 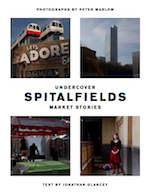 Undercover Spitalfields: Market Stories by Peter Marlow is the most visual of the three books. The photographer was commissioned by market owners Ballymore to celebrate 120 years of the Victorian complex, and he's done a splendid job of capturing the stalls, architecture, residents, chefs and vendors, with some particularly fine portrait shots. The compilation ranges a little further than the market itself, taking in some of the old weavers' houses to the east, as well as the occasional foray into Shoreditch. An introduction by architecture critic Jonathan Glancey neatly introduces the historical context, describing the waves of immigration and regeneration that have characterised the wider area. Oddly, though, the photogenic people and places of Brick Lane are almost entirely absent, while further-afield locations such as Boxpark and Village Underground (on the cover) are represented. The controversially doomed Fruit and Wool Exchange is also omitted, as you might expect. Nevertheless, if we consider the book for what's there, rather than what is not, it's a fine collection of photography, capturing choice aspects of the market as it is today. Out now from Magnum Editions.